Adapted from Ibsen's Little Eyolf and directed by Mark Jackson. Scenery Nina Ball. Costumes Christine Crook. Lights Heather Basarab. Sound Matt Stines. Video Wolfgang Wachalovsky. Photos David Allen. The script for LITTLE ERIK is published by EXIT Press and is available for production here. Watch the short docu-trailer created by Peter Ruocco. Reviewers were wide-ranging in their response to LITTLE ERIK during its Aurora Theatre Company premiere. Though many embraced the moral and emotional complexity of the characters and situations, what complaints there were followed the basic trends that greeted Ibsen's original—namely, moral judgments leveled against how characters handle their grief and their tangled relationships, as well as objections to the play's mix of styles and its ending. So it would seem that today, as in 1895, we sometimes still don't want our theater to reflect life's undeniable messiness. Ibsen's play misbehaves in ways I find exciting, truthful, and productively problematic. The title itself, which seems to reference one character while actually pointing to another, plays with our expectations of consistent dramatic structures built around single protagonists. I was gratified by how often members of the Aurora audience approached the actors or me afterwards to express their appreciation for the play's brutal honesty about grief and gender roles. I wrote LITTLE ERIK to encourage compassion for people going through great personal trauma, trying their best and failing. Who are we to judge another person's grief? Or how they handle their troubled relationships? Don't we hope our friends and neighbors will grant us their understanding when we inevitably stumble through life's tangles? Starring Michael Ray Wisely and Beth Wilmurt. Set design Maya Linke. Lighting Joe D'Emilio. Costumes Ashley Rogers. Props Kirsten Royston. Photos David Allen. Watch this teaser for the Aurora Theatre Company production. In The Letters, a Ministry Director calls his employee Anna into his office for a job-related interview, but it is 1931 in the Soviet Union and things are not what they seem. Is Anna being offered a promotion? Is the Director making a sexual advance? The Director seems to have a hidden agenda – or is it Anna who has an agenda of her own? The Letters is a suspenseful cat and mouse game that grows more menacing as the seconds tick away. 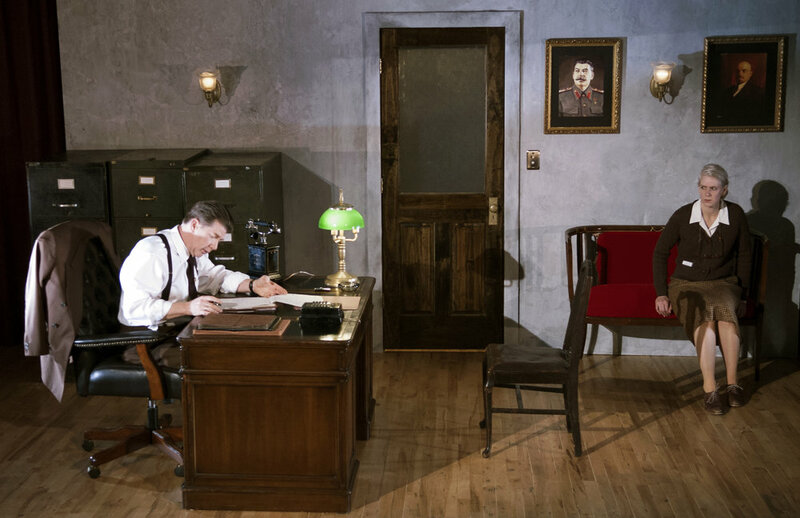 Despite its distant setting, the play's themes of institutional paranoia and ambiguous harassment in the workplace ring quite true in contemporary America. John W. Lowell's compact, intimate edge-of-your-seater made for a good way to inaugurate the Aurora's new second stage space and I was very glad to help break the joint in. Scenery Nina Ball. Lights York Kennedy. Costumes Fumiko Bielefeldt. Sound Matt Stines. Properties Seren Helday. Dialect Coach Lynne Sofer. Starring Joy Carlin, Rod Gnapp, Joseph Salazar, and Beth Wilmurt. 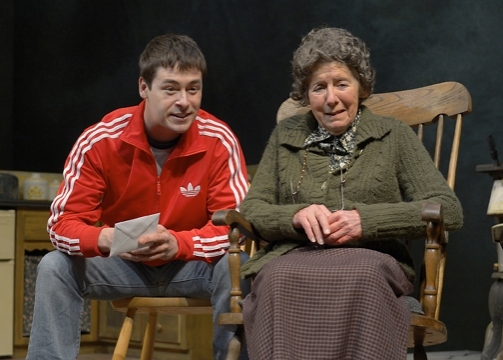 The Beauty Queen of Leenane played at Marin Theatre Company May 23 to June 16 2013. "Riveting... staged with depth and insight by director Mark Jackson to spellbinding effect... Beth Wilmurt gives a tightly coiled performance as Maureen, and Joy Carlin is mesmerizing as the crafty Mag." "One thing that's so striking about Beauty Queen is how slowly and effectively it creeps up on you... 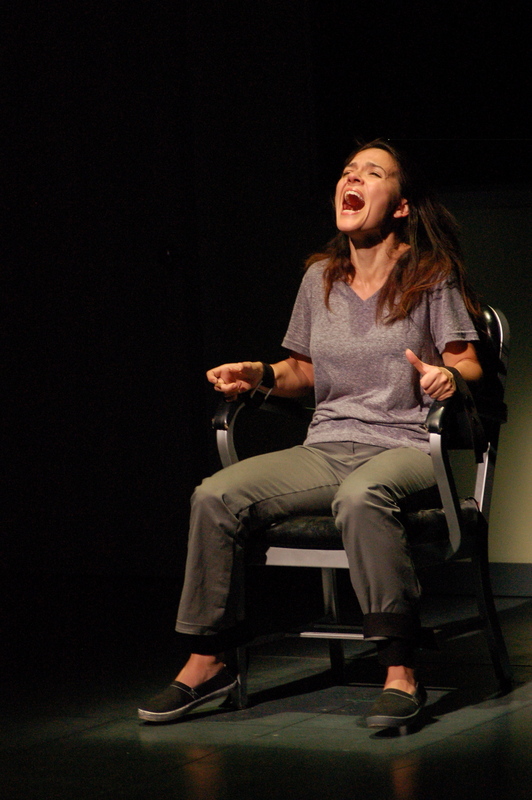 It's an often hilarious play that puts you through the emotional wringer before it's through." "Jackson turns the received template for Beauty Queen on its head. Ever since Garry Hines' Druid Theatre premiere, the monstrously selfish shut-in mother Mag has savored her endless battle with her embittered 40-year-old daughter Maureen in broad strokes... Jackson reverses that approach even before the play starts. Nina Ball's striking set is a sparely furnished cottage floor, without walls, floating in a metaphoric inky-blue or grunge-yellow space. The realism is in the props and sound effects, but more so in the performances. The necessary shut-in claustrophobia is provided by Jackson and his actors... The fast pace is one of the show's strengths, heightening the comic tension. As the rich textures of McDonagh's stage Irish mingle with those of the performances, Jackson's Beauty Queen builds to a scarifying but moving finale." "Director Mark Jackson’s cast is uniformly excellent... With their talents, Beauty Queen always entertains, but its true payoff comes toward the end." "Director Mark Jackson’s production for Marin Theatre Company etches [the relationships] with realism and a savory dash of melodrama. ...A finely detailed portrait of a mother and daughter that is so fraught, you flinch and still you can’t turn away... It’s hard to ask for much more from a two-hour evening of theater... Director Jackson and his excellent cast don’t go for sensationalism as much as cringe-inducing shock... 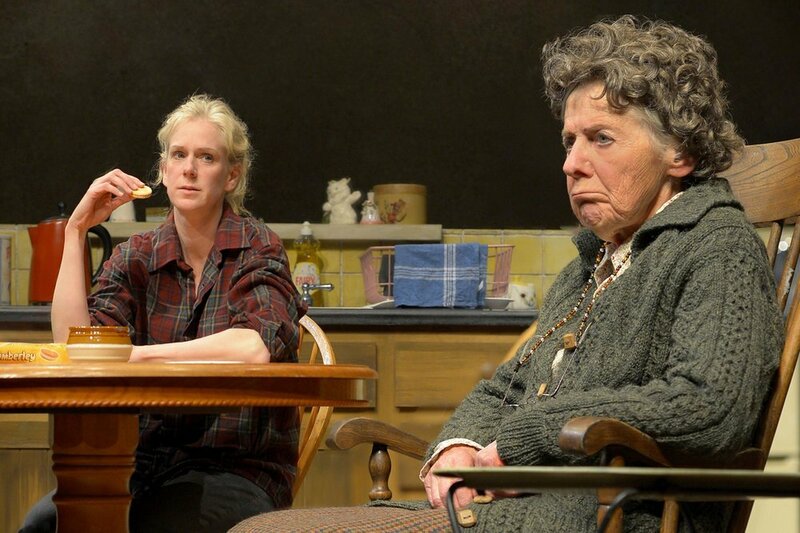 The most extraordinary thing about this production is the tension between Wilmurt and Carlin, two ferociously good actors creating a mother-daughter bond that is palpable. And terrifying." "An explosive, funny play... 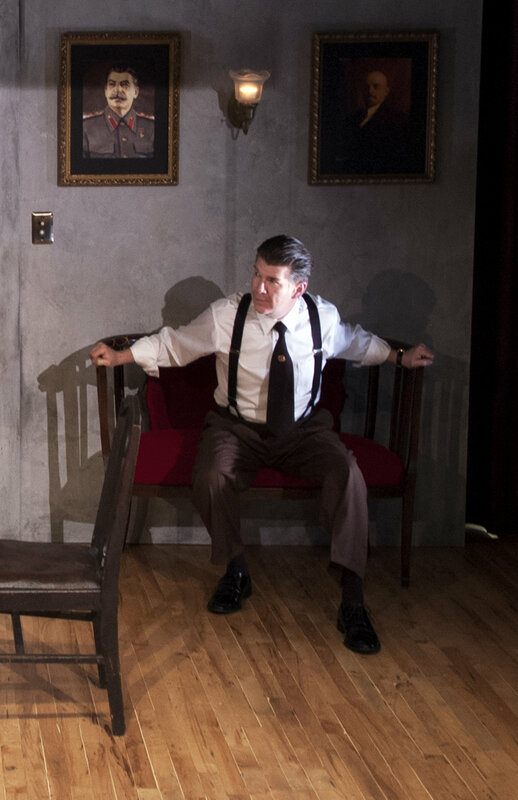 The four actors under the direction of Mark Jackson deliver the language so compellingly... Jackson’s staging allows the characters to develop without overdramatizing... A stunning play in a stunning production." When Jasson Minadakis, MTC's artistic director, emailed me about directing McDonagh's play I asked him if he'd contacted the person he'd actually intended to contact. Living room family dramas are not exactly what I'm known for. But when I read Beauty Queen I connected immediately to McDonagh's severe sense of theatrical showmanship. His near-perfect craftsmanship, and his ability to rip humor out of the most uncomfortably harsh emotional situations, made working on the production an education in dramaturgy, character construction, and the theatrical possibilities of supposedly "realistic" stage worlds. Also the play is just so uncommonly fun and heartbreaking. The cast did a bang up job in the end, and my first experience directing a living room family drama ended up nowherenear the thumb-twiddler I would have expected it to be! Scenery Nina Ball. Costumes Christine Crook. Lights Jacob Petrie and Joan Arhelger. Sound David Graves. Photos Benjamin Privitt. The script for MARY STUART is published by EXIT Press and is available for production here. 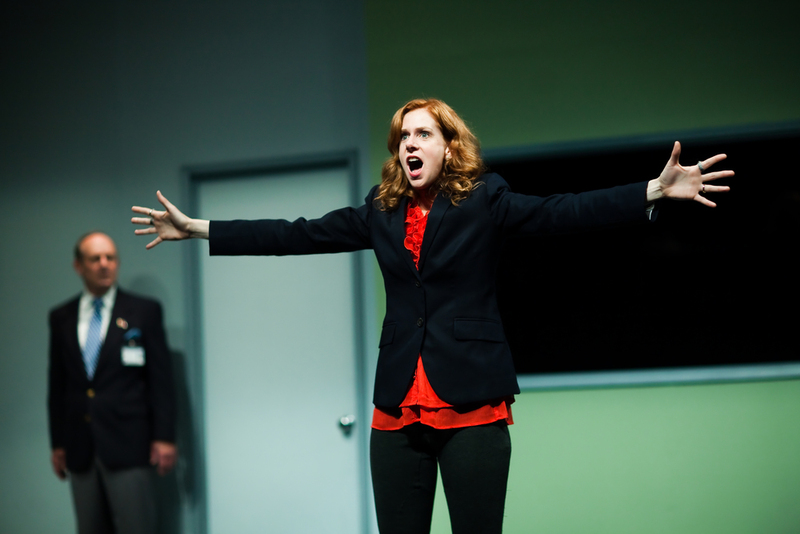 Named one of the best Bay Area theater productions of 2010. Though I cut quite a lot, I found that indeed nothing needed to be added to Schiller’s text to make it “relevant to today.” It already is. The designers, actors and I created a recognizably contemporary stage world in order to get the obvious out of the way and put the focus on the characters, their actions, debates and conflicts. I love the messy psychology Schiller granted all his characters, how they contradict themselves and do battle with their moral conundrums. I’m also fascinated by the collision of times, places and cultures to be found in a contemporary American production of a 200-year-old German play based on 400-year-old British history. Schiller captured something internationally and eternally human when, through Mary Stuart, he posed an important question that it seems every generation of every culture must answer. What do we do when our system of justice, our sense of morality, and our own personal desires don’t meet eye to eye? Scenery Nina Ball. Costumes Kevin Clarke. Lights Joan Arhelger. Sound Matt Stines. Photos Benjamin Privitt. The script for FAUST Pt1 is published by EXIT Press and is available for production here. I wrote a quite different adaptation of Faust back in 1992 as a college class project. Though I never did anything with it, this early attempt planted a fertile seed, and in 2007 the time seemed right to give it another go. I saw in our shifting world Goethe’s theme of the struggle between desire and responsibility, and his important question as to how deeply we are willing to consider the ways in which our personal actions impact the world outside ourselves. The only thing I salvaged from my 1992 script was the notion to pare Goethe’s sprawling epic down to the triangle between Faust, Mephistopheles and Gretchen, and to bring onstage the character of Gretchen’s mother. Though not at all true to the letter of Goethe, I was keen to remain faithful to his impulse. Goethe created a brilliant conundrum of a play, full of contradictions and tantalizingly loose threads, as well as a brash mix of theatrical styles. It really is the sort of thing that requires an audience to complete it. So, when after one early performance a group of four who had remained in their seats discussing the work flagged me down wanting to talk more about it, I suspected we’d done right by ol’ Goethe and our audience, both. That this sort of thing continued throughout the run confirmed that indeed we had. Scenery Giulio Cesare Perrone. Costumes Fumiko Bielefeldt. Lights Heather Basarab. Music David Graves. Photos David Allen. “Mark Jackson has quickly made his name as one of the most provocative stage auteurs in the Bay Area with his balletic approach to movement. In The Death of Meyerhold, he swept us away in an epic flow of theater, politics and history. In Salome, he transformed Oscar Wilde's classic into a highly stylized pageant of poetry and physicality. Now the adventurous director returns to the Aurora Theatre Company in Berkeley to mine the symphonic richness of stillness in August Strindberg… Silences explode like hand grenades in the opening scenes of this visually arresting revival of Miss Julie." We might like to pretend that we have moved beyond the gender and class politics of Miss Julie, but sadly we have not. That the Aurora production extended its run is evidence that people still feel a need to grapple with Strindberg’s “dated” masterpiece. Despite Strindberg’s own famous preface in which he tried to situate the play firmly within the genre of Naturalism, by today’s standards Miss Julie feels much more impressionist and even expressionist. The designers and I leaned into this, and the actors and I tried to create a dance of desire with staging that was precise and choreographic without pointing at itself. We played with the power of stillness, silence and duration in order to deal with Strindberg’s explosive subtext. It was quite a challenge and on some nights it worked better than others. But overall, audiences seemed to enjoy witnessing three people go at each other like vicious cats and dogs. That’s entertainment! Scenery Nina Ball. Costumes Valera Coble. Lights Jon Tracy. Sound Sara Huddleston. Photos Benjamin Privitt and Jessica Palopoli. I've always felt Macbeth to be a galloping, fun, scary, sometimes disturbing thriller that’s also smart and well worth arguing over. 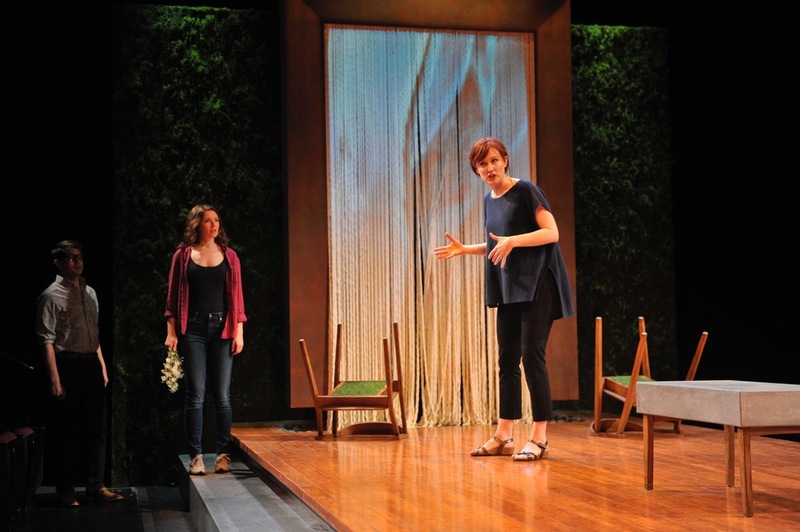 The play is about a marriage that unravels after a moral line is knowingly crossed. That marriage unraveling is also a nation unraveling. The ambition that fuels the momentum of this strikes me as a young impulse in perpetual motion forward and up. So I cast the leads young and asked the designers to create a fashion-conscious, energetic atmosphere for the play’s many acts of bloody ambition. Audiences were keen to witness such acts, and the production sold out from beginning to end – despite the efforts of a few critics who predictably condemned it for not conforming to their preconceptions of the somber, grey-hued “Scottish play.” If there is a curse on the play, it is the curse of expectations. It’s impossible for any single production of Shakespeare’s awkward masterpiece to please everyone. But I think we managed to fashion a good rollercoaster, and I was very proud of it. People argued over it, to be sure. But ain’t that what art is for? Co-production with Art Street Theatre, Deutsches Theater Berlin and San Francisco International Arts Festival, with support from Mime Centrum Berlin, the Alexander von Humboldt Stiftung, San Francisco Grants for the Arts, Zellerbach Family Foundation, and the Theatre Bay Area CA$H Grant. Berlin premiere October 2007. San Francisco premiere May 2008. Created and performed by Mark Jackson, Tilla Kratochwil, Sommer Ulrickson, and Beth Wilmurt. Design Alexander Polzin and Suna Elbasi. Costumes Ute Grenz. Photos Iko Freeze and Lena Böhm. Yes Yes to Moscow is a choreographic adaptation of Chekhov’s Three Sisters. 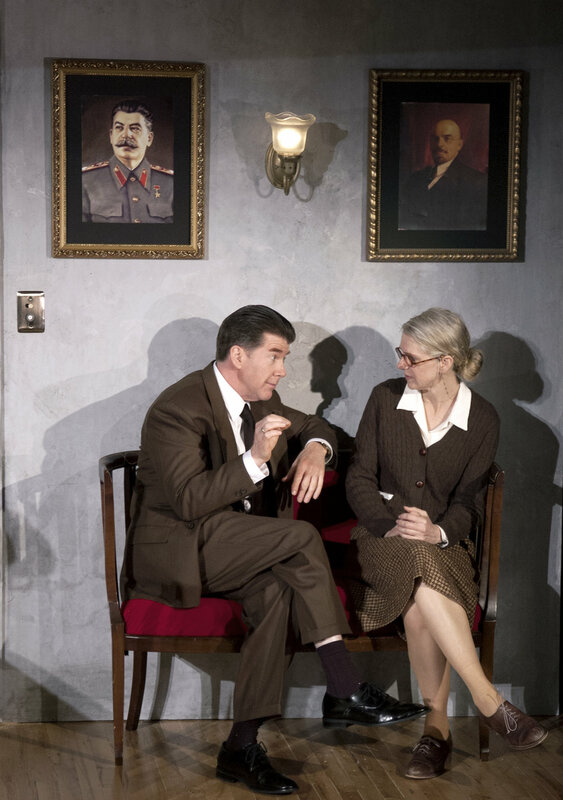 The piece imagines that the title’s siblings have finally made their coveted return to Moscow. But, since their lives have been entirely defined by their desire to go to Moscow, now that they have arrived their purpose is lost. They go into shock, retreating to their former selves, longing for the Moscow of their imaginations. Pent up in a kind of abstract holding cell, they are studied by a man at a desk who feeds them stage directions and lines from the male characters of their play, slowly prodding them to face their new reality. The piece was our way of asking questions about the expectations we have regarding happiness in the complex, very international contemporary world. We also wanted to see if Chekhov could dance. Turns out he can. Scenery James Faerron. Costumes Raquel Barreto. Lighting Chris Studley. Sound Sara Huddleston. Photos Clayton Lord. The script for AMERICAN $UICIDE is published by EXIT Press and is available for production here.